Sitting for a long time in your office takes a toll on your health. Longer hours sitting can cause changes in your posture, can cause back pain and strain and can make you feel tired and sleepy. This is why instead of just using an ordinary office chair; a mesh back ergonomic chair is more preferred by many people. The Amazon Basics Mid-Back Mesh Chair is a classic mid-back mesh chair that reduces the stress and the strain of sitting long hours at the office or your own home office. It has a modern profile and a stylish appearance which can match any office design or style. If you are looking for that classic mesh chair style then the Amazon Basics Mid-Back Mesh Chair could be the one you are searching for. You need a sensible and stylish office chair with a mesh mid back design like the Amazon Basics Mid-Back Mesh Chair. This has a classic design with a modern look which will make your office or home office tasks easier and a lot more efficient. This Amazon Basics Mid-Back Mesh Chair has a number of good features. Learning what makes this mesh chair better than other brands and models will help you make a smart shopping decision. Here are the best features of this mesh office chair. Add an air of style in your office or home office when you use the Amazon Basics Mid-Back Mesh Office Chair. This is a stylish mesh chair that has a modern profile and a sophisticated design. This chair means business. It is not a very firm chair made of plastic or metal which appear cold and distant. The design looks inviting and comfortable; ready to help you work for long hours in your office or home office. The Amazon Basics Mid Back Mesh Chair will help you work on different projects and tasks in a chair that is designed and adjusted according to your needs. Because every person is different, it makes sense to have a completely adjustable mesh chair for your home or office. This chair’s height may be adjusted using pneumatic controls found below the seat. This control raises and lowers the seat to level your body to any table height. You can reach taller tables and work effortlessly. You can work on lower surfaces without slouching or bending which can affect your posture. The chair’s height may be adjusted even as you remain seated on the chair. You may also pull out on the control lever to let your chair tilt back. You can also sit forward and push the control in to stop tilting. There is a special knob at the bottom of the seat to allow the seat to rock back and forth. Tightening the lever prevents this motion. To complement the color of this Amazon Basics office chair, the mesh back is also colored black. The mesh cover actually covers even the back of the chair. The mesh back allows you to take advantage of efficient lower back support and border detailing as well as its gentle curved back to improve breathability. The mesh back reduces any strain on the back. It lets air flow in and out the mesh fabric so there’s no need to worry about perspiration on your chair. And aside from the seat back, the armrests also wear the same durable and efficient materials. Some office chairs are simply standard chairs with no wheels. This Amazon Basics mesh chair has dual-wheel casters that will let you cruise along your office. You can use this office chair on carpeted floors, cement or natural stone. Having two dual caster wheels will let you move around with ease. You can multitask: work on your computer, get files from a filing cabinet from across the room or talk to a team member in another room with this efficient mid-back mesh chair. Compared to leather-surface chairs which could be too much to handle. The mesh back is so simple to use and maintain. Just use a soft brush with water and soap and your chair will be ready for the next round. With leather seats, you need to avoid water, sauces, juices and other types of food that can ruin this big time. As with buying office chairs or any type of furniture, you must be very careful about the advantages and disadvantages of a product. You must learn about the pros but never overlook any disadvantage. This mesh chair is made from strong and long-lasting materials. The black mesh that covers the back of the chair and the padded seat is very strong. This can withstand all-day pressure without losing its shape and its stretch. You can use this daily, lean over it and rock back and forth; still, this will remain in shape. The border detailing is made from very strong rubber. This one basically keeps the mesh fabric in place. This part is strong as it is durable. This won’t come off unless it is removed by a knife or any sharp object. The T-shaped armrests are made of nylon and will last for as long as you use this chair. These are strong and will never lose their shape no matter how much you use this chair. What’s great about this mesh chair is you can easily find the control handle to make the chair taller or shorter. The controls are simple. Its simple pneumatic control is found at the lower part of the chair to raise and lower the seat. All you need to do is firmly pull up the control handle and then lean forward to remove your weight from the seat. And to lower the seat, remain seated and pull the handle up until you have reached the ideal chair height. Aside from making the chair taller or shorter, you can also make the chair rock using the same control handle. Simply pull out the control handle to tilt the seat back and push the control handle in to prevent it from tilting. There is also a convenient tilt-tension knob underneath the chair to make it harder or easier for it to tilt back and forth. The shape of the Amazon Basics mesh chair makes it very comfortable to sit even for long hours. The seat is soft but not too soft that you will slip off. The armrests to keep your arms and elbows well-rested especially if you want to take a break from typing or using the computer. The back is curved with a mesh lining to improve breathability. Just use a clean dry cloth and wipe away stains, messes and spills. But if you want to deep clean the seat, you can use a wet/dry vac and clean it inside out. The armrests may be wiped clean with a damp cloth. The wheels are easy to clean as well. Just tilt it a bit to remove dust and dirt that usually accumulate in between the two caster wheels. This chair is so versatile. You can use it as an office chair, as a home office chair, computer chair or as a receptionist chair. This is ideal for posture correction and for people who are suffering from back pain, hip pain and for anyone who works long hours in front of a desk. While some mesh chairs are shipped with very minimal assembly, you may need to do a lot of screwing and assembling with this model. This is one of the most frustrating things about this chair according to most customers. There are times when you just want to remove the armrests to give you more room, right? Well, this is not possible with this chair. The armrests are screwed to the seat and there is no way to remove it to use this as a regular chair. If this is what you want, better look at other types of chairs instead. This chair has a weight limit of 225 pounds. It also features a small seat and non-removable armrests so if you have a larger frame or body size this mesh seat may not be the best option for you. 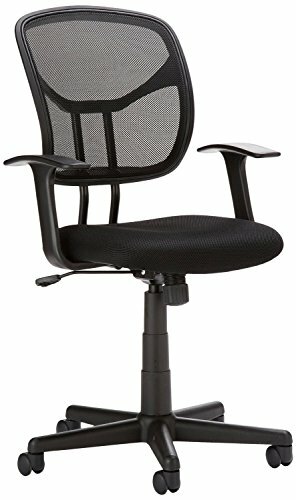 The Amazon Basics Mid Back Mesh Chair is a comfortable, adjustable and modern computer, office and study chair. It has great features but you cannot deny that there are also some disadvantages. But all-in-all, you may want to check this out if you are looking for a basic office mesh chair.